FSP launches world's slimmest C14 USB Power Delivery Specification adapter New thin, flexible 60W USB-C power supplies provide up to 20V at 3A | FSP TECHNOLOGY INC.
【【Taipei, Taiwan - Sep 20th, 2016】 Global power supply design and manufacture specialist, FSP, is pleased to announce new ultra-thin external power supplies, the FSP060-D1AR4 and FSP060-D1BR4, that support the USB Power Delivery Specification, and provide up to 60 Watts of output power at 5, 9, 12, 15 and 20 volts. The FSP060-D1AR4 is the thinnest C14 AC socket USB Power Delivery Specification adapter available today, with dimensions of only 77.3 × 92 × 25.4 mm and weighing in at only 215 g.
Applications for this versatile power supply include mobile phones, tablets, TVs, mass storage devices, expansion ports, laptops, monitors, automotive customer convenience ports, payment terminals, set-top boxes and workstations. Now, one slim adapter can power almost any consumer electronics product – even some of the most power hungry. With just one flexible adapter able to support almost any type of device, organizations, families and individuals can simplify their working and leisure environments, save money, and avoid waste. Compared to competing products, FSP's new adapters are not only thinner and lighter, but offer higher maximum output voltage, higher power density of 6.01 W/in3, and include a ground wire for safety and stability. FSP's new USB power supplies communicate with connected devices to automatically deliver the power level the device requires at all times, enabling much faster charging, saving power costs, reducing heat, and enhancing safety. FSP060-D1 series power supplies meet US Department of Energy (DoE) Energy Efficiency Level 6 standards. From 2016, this standard is a legal requirement that must be met for an external power supply to be sold or shipped to customers in the US. In addition, safety is further enhanced by over current protection, over voltage protection, over temperature protection, and short circuit protection. These new FSP power supplies use the USB type-C connector, which is the first reversible USB connector, and retains electrical backward compatibility with older USB standards. 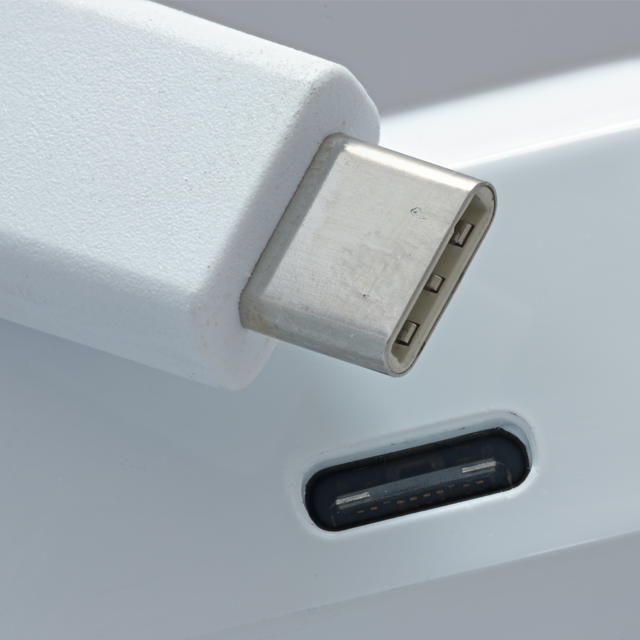 USB-C puts an end to the annoyance and damage caused by accidental upside down connector insertion, which plagued earlier USB devices. USB-C is also smaller than micro USB and offers full support for the USB Power Delivery Specification.